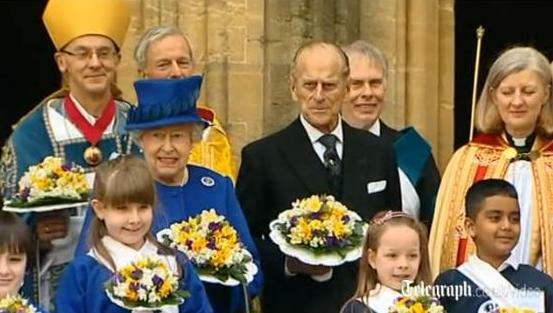 The Queen, accompanied by the Duke of Edinburgh, attended the Royal Maundy Service at Christ Church Cathedral in Oxford. Click above to see an article and video from The Telegraph. Yummy rich blue, a hat that looks like it got caught in a fancy tornado, and the Albert for the win! 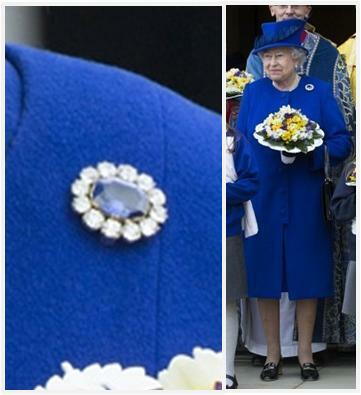 This is the fifth year in a row for blue-toned outfit, I don't think anyone guessed Prince Albert's Sapphire Brooch would be it in the comments on the Maundy flashback. Were you surprised?